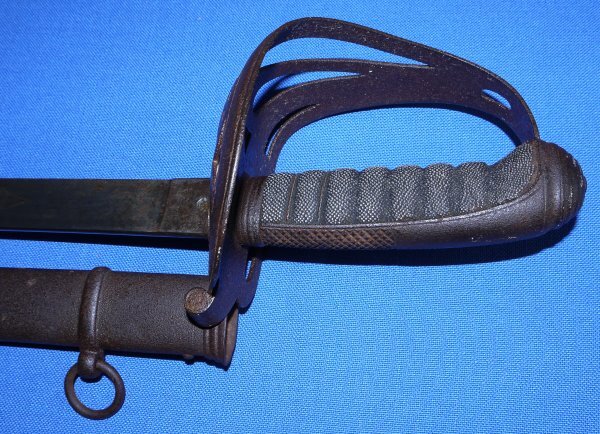 In overall sound condition, a rare Victorian Royal Irish Constabulary Officer's Sword. The maker's / retailer's name is very rubbed, but you can see the last "eland" of the name, so it is "J Ireland & Sons, Ellis's Quay, Dublin". 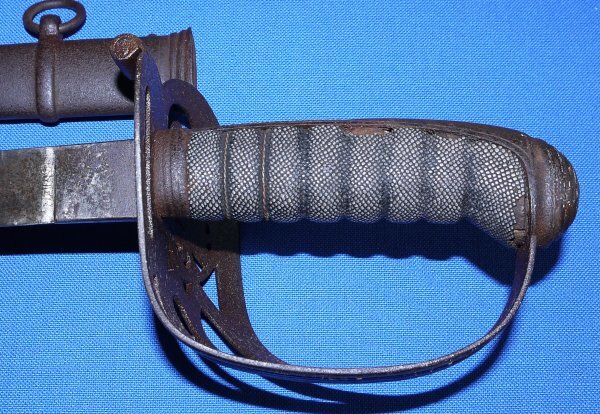 The scabbard is surely original but there must be something blocking near the tip end, as a small 0.8 cm gap is present between the scabbard and hilt when fully sheathed (it may well be possible to knock out any dirt / obstruction). The 33 1/4 inch flat blade is overall good, the etching still clear except for the maker's / retailer's name, the tip has a very small wiggle, there are a few (not many) ominous (apparently period) nicks to the blade. Blade firm in the hilt. 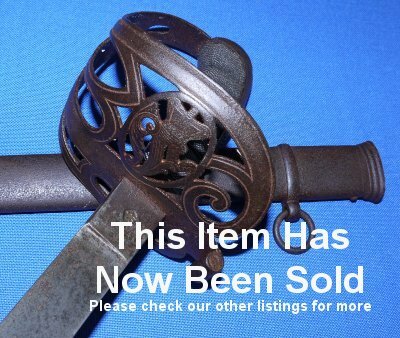 The hilt is sound but with rust pitting, more so inside the guard. The fishskin grip is quite good but some small losses near the edges. Some of the twisted grip wire is missing. The steel scabbard has rust pitting but is sound. The sword sheathes and draws OK except that it does not fully sheath by around 0.8cm. These are such rare swords. Yours for £750. Please quote item reference P45. Further / full sized images available upon request. Box 0211-1.18 (2.126).